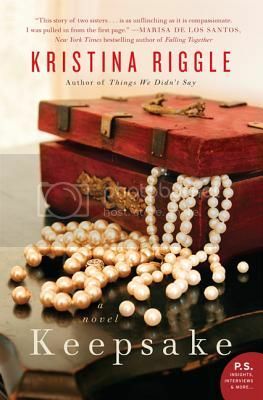 Kristina Riggle is the author of four novels, the most recent of which is Keepsake, which is the story of a hoarder trying to clean up her act and the family who attempts to help her. I previously reviewed Riggle’s other novels: Real Life and Liars, The Life You’ve Imagined, and Things We Didn’t Say. I emailed with Riggle recently to talk about Keepsake and her writing career. Please see the end of this post for a giveaway opportunity. Jen: How did you choose to write about hoarding? What about it sparked a story for you? Kristina: Inevitably, I will write about something that fascinates me. Years ago, I saw an episode of Oprah about a compulsive hoarder. Her personal appearance was immaculate, and the exterior of her home was beautiful. By all appearances she was an intelligent, rational, articulate woman. When she opened the door to her home, inside was a horror show of filth and debris. Even more striking was when she showed the producers an empty garbage can. She could not bear to ruin the “perfect” garbage can with trash, though the rest of her house was, in essence, a trash heap. When I was brainstorming new book ideas, it seemed like a natural topic that would be perfect for the type of character-driven story I like to write. It also turned out — not deliberately — to use some of the same themes I covered in an earlier unpublished manuscript, which also featured two sisters with opposite temperaments brought together reluctantly. Jen: Did you have to do a lot of research about hoarding to write Keepsake? Kristina: A fair amount. I read books and articles, and watched the currently popular hoarding reality shows, of course. The most interesting thing I did was to fill out a hoarding self-help workbook “in character” as Trish. There are many varieties of hoarder, and this exercise helped me fix her character in my mind. I also worked with a former college roommate who is a clinical psychologist like the Seth character. I already had his character in the works when my friend and I reconnected. That was a great bit of serendipity. Jen: Your first book, Real Life and Liars, had at its core a physical illness, but your three books since then deal with characters with more psychological diseases: gambling, alcoholism, hoarding. Is there something that attracts you more to characters with problems of the mind, rather than solely of the body? Jen: How does it feel releasing your fourth book? Is it much different than releasing your first? Kristina: It does feel a little more normal, now, going to book events and talking to readers. But I still — and I’m sure always will — get a thrill out of fan mail, and signing books. I’m a little more anxious, too, in some ways. The longer I do this, the longer I want to do it. Forever, if I can. As long as my fingers can type. That’s a tall order in today’s publishing climate. But I’m hopeful for a long career. Jen: Can you share one piece of advice for aspiring writers? Kristina: I just heard this quote from the late Ray Bradbury on NPR’s Fresh Air: “By doing things, things get done.” If you want to be a writer, then by all means, write. If you want to publish, then research publishing in whatever form you choose to pursue. The point is, you can’t wish and hope yourself into being a writer anymore than you can anything else. I have two copies of Keepsake to give away to a lucky reader anywhere in the world. Please enter on the form below by the 11:59 pm Eastern on Friday, July 20th. When Trish’s younger son, Jack, breaks his arm in an accident around the house, his doctor calls Child Protective Services. It isn’t that Trish is abusive by any means – she loves her son dearly – but her house may not be a safe place for him to live, in fact her older son Drew already chose to move out and live with his girlfriend’s family. The problem is that Trish is a hoarder, just like her mother was. She started years ago, as more of a pack rat, but after her husband left the obsession to keep things grew until her house became bad enough that her son could have an accident in the piles of junk capable of breaking his arm. Now Trish must show Jack’s case worker that she can clean up her act – literally – if she wants to keep him. The idea of Jack being taken away spurs Drew to reach out to his Aunt Mary, Trish’s long-estranged sister. Keepsake is told from both Trish and Mary’s points of view, the woman with the uncontrollable urge to hoard and the woman with OCD, which are evidently two sides of the same coin. Having both of them narrate keeps a good tension between the current crisis situation and their shared past which made these women who they are. This also helped keep the plot of Keepsake be driven along by the characters instead of simply by the plot. In Keepsake Riggle is telling an incredibly compelling and engaging story. The hoarding pathos rings true, as does the tension between Trish and Mary (not to mention the rest of the family). The family must learn how to work together in order to move forward and heal, but Riggle never makes things pat or maudlin. Keepsake is a wonderful family drama, and not one that seems the same as all you’ve read before. Highly recommended. If you missed it, yesterday was our virtual book club for “The Life You’ve Imagined” by Kristina Riggle. Please feel free to go back and add any thoughts you might have if you weren’t able to discuss yesterday. Today we’re actually getting the opportunity to ask Kristina Riggle some questions about the book. I’m going to start with some based on yesterday’s discussion, but please feel free to add more in the comments, or respond to her responses, and Kristina will pop in as she’s able to shed some more light on things for us. What made you give Cami a gambling addiction? I just haven’t been able to get over how different that was from anything else I’ve read recently. It seems like everyone in the book club agrees that it worked very well in “The Life You’ve Imagined,” but other people were surprised to read it as well. As a follow up, Cami’s future seemed to be to be the most ambivalent of all of the women, and another reader mentioned that she was really concerned for Cami not seeming to have a plan in place to deal with her addiction. What was the reason you chose to leave her like that and not wrap up her story more? And ONE more about Cami: did you have to do a lot of research about gambling and gambling addiction to write her story? There was some debate over whether people wanted – at any point – for Amy to break things off with her fiance. Did you ever secretly want her to, or think about taking the story in that direction? The men of Haven, everyone seems to want to know about them, and many people seem to think there really aren’t any good ones. Thoughts? If anyone else has any questions, ask away!